Durga Puja is the biggest and most important occasion of the year in Kolkata, the capital of West Bengal. The festival sees huge, elaborately-crafted statutes of Goddess Durga installed in homes and lavishly decorated podiums (called pandals) all over the city. At the end of the festival, the statutes are paraded through the streets, accompanied by much music and dancing, and then immersed in the Hooghly River (a distributary of the Ganges River in Kolkata). 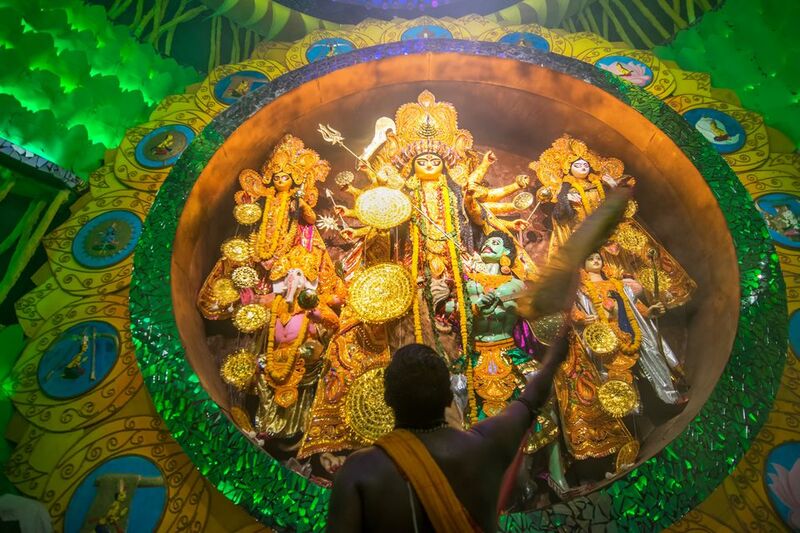 The magnificence of the festival, from start to end, is revealed in these Durga Puja pictures. Continue to 2 of 25 below. The majority of Durga idols are crafted in Kumartuli in north Kolkata, around 30 minutes drive from the city center. The name literally means "potter's locality" and as it suggests, the area was settled by a group of potters. You can go to the workshops and see the idols being made. Continue to 3 of 25 below. The eyes are drawn on the idols of Goddess Durga during a special ritual called Chokkhu Daan. This is performed on Mahalaya, about a week before the start of the Durga Puja festival. The Goddess is invited to come to earth on this day. Continue to 4 of 25 below. Depending on their size, the idols are transported on special trolleys and in trucks to be installed. Continue to 5 of 25 below. There are thousands of pandals in Kolkata and each has a different theme. Some maintain traditional displays, while others are contemporary. The one pictured here has a traditional design. A highlight of the Durga Puja is visiting all the different pandals (known as pandal hopping). Continue to 6 of 25 below. Durga is depicted with her four children, Kartikeya, Ganesha, Saraswati, and Lakshmi. Traditional Durga idols are decorated with plenty of ornaments and bling. Continue to 7 of 25 below. The idols are intricately and thoughtfully crafted in great detail. Continue to 8 of 25 below. The exterior of the pandal is a big attraction. Continue to 9 of 25 below. The trend for contemporary themes is growing, with organizers competing to draw the crowds. A lot of effort is put into the decorations. Continue to 10 of 25 below. Expect huge crowds at the most popular Durga Puja pandals. Continue to 11 of 25 below. Some pandals aim to craft the biggest Durga idol. This one stands 70 feet tall. Continue to 12 of 25 below. Contemporary Durga idols are crafted in different styles, typically without the rich decorations that the traditional idols have. Continue to 13 of 25 below. Regional culture is a popular Durga Puja theme, with many of the pandals decorated with various styles of folk art. Continue to 14 of 25 below. Other pandals use high-tech lighting and special effects to woo the crowds. Continue to 15 of 25 below. The decorations can be as eye-catching as the idols. Continue to 16 of 25 below. No matter what the theme, it's always exciting to enter the pandals and be enthralled by the mesmerizing displays. Continue to 17 of 25 below. 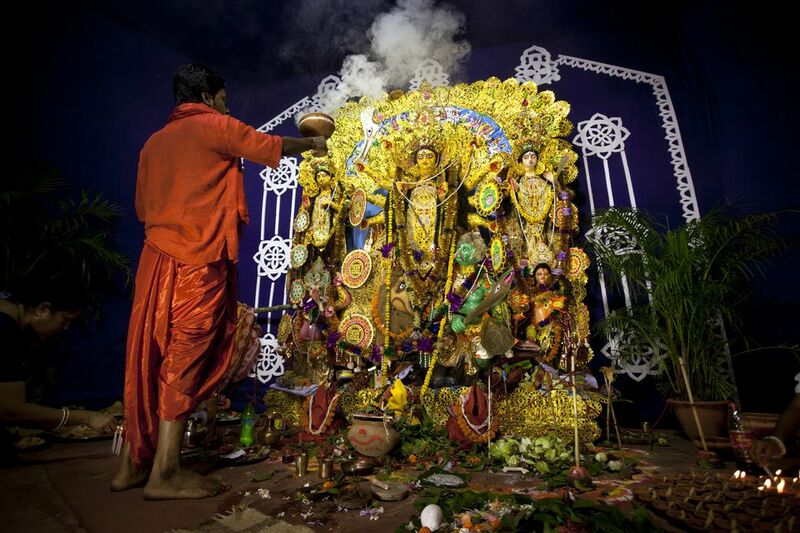 Traditional "Bonedi Bari" pujas are held in the city's palatial old private mansions. The mansions belong to affluent aristocratic zamindar (landowner) families who have been carrying on the pujas for centuries. They're spread out across Kolkata (as well as other major towns in Bengal). Two of the most famous ones are Sovabazar Raj Bari and Rani Rashmoni Bari. Continue to 18 of 25 below. Tuul & Bruno Morandi/Getty Images. Devotees, especially women, come to seek Goddess Durga's blessing during the festival. Continue to 19 of 25 below. At certain times of the day, pandits (Hindu priests) perform aarti ceremonies (worship with fire) for the Goddess. These are popularly attended by devotees. Worship is concluded with a maha aarti (great fire ceremony), which marks the end of the important rituals and prayers. Continue to 20 of 25 below. A popular part of Durga Puja rituals is the performance, by devotees, of the Dhunuchi dance in front of the Goddess. This is done with a clay pot (a dhunuchi) filled with a smoking mixture of camphor, incense and coconut husk. The dance is accompanied by traditional drums and drummers. Continue to 21 of 25 below. On the last day of the festival, Goddess Durga returns to her husband's abode and the statutes are taken for immersion. Married women offer red vermillion powder (sindoor) to the Goddess and smear themselves with it (this powder denotes the status of marriage, and hence fertility and bearing of children). This ritual is known as Sindoor Khela. Continue to 22 of 25 below. Devotees pray and dance in front of the Durga idols before the idol is taken for immersion. Continue to 23 of 25 below. At the conclusion of the festival, after worship has been completed, the idols of Goddess Durga are taken out in procession and immersed in the Hooghly River. Continue to 24 of 25 below. After the immersion process, low-caste men stand in the river and ensure that the thousands of Durga idols make their way down the river safely. They will stand there in the water for hours upon hours, pushing the statues along into the current. For their trouble they are allowed to remove any remaining valuables from the idols, such as bracelets and plastic jewels. Continue to 25 of 25 below. Unfortunately, pollution is a big concern following the festival. Although many Durga idols are made out of clay, they are covered in toxic paint and their decorations are non-biodegradable. This clogs the river where the idols have been immersed.